Morris County is a county located in the U.S. state of New Jersey, about 25 mi (40 km) west of New York City. According to the United States 2010 Census, the population was 492,276. It is part of the New York Metropolitan Area. Its county seat is Morristown. Morris County was the eighth-wealthiest county in the United States by median household income, and ranked tenth by per capita income. It is the ninth-wealthiest county in the United States by personal per-capita income, the highest rank in New Jersey. The county ranked third in the New York Metropolitan area in terms of median income. Morris County was named after Colonel Lewis Morris, governor of New Jersey in 1738/9, the year the county was named. 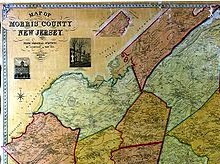 The area of Morris County was inhabited by the Lenape prior to the coming of the Europeans. They lived along the rivers and hunted game, fished, collected plants and nuts. From 1611 to 1614, the Dutch established the colony of New Netherland, which claimed territory between the 40th and 45th parallels, which included northern New Jersey. The Native Americans traded furs and food with the Dutch for various goods. In return the Dutch gave the Native Americans metal pots, knives, guns, axes, and blankets. Trading with the Native Americans occurred until 1643 when a series of wars broke out between the Dutch and Native Americans due to various disagreements and misconceptions. On August 27, 1664, three English ships approached Fort Amsterdam and the fort was surrendered to the English. The English now controlled New Netherland and Morris County was now under control of the colony of New York. Relations with the Native Americans improved for a while. There was a war with the Dutch ten years later. The Dutch re-took control of New Amsterdam but after a year returned it to the English. Relations with the Native Americans and English improved for a while. Objects collected for display at the Morristown Neighborhood House formed the beginnings of the Morris Museum collections, and education has been an intrinsic part of the museum’s program from its inception. Mrs. Aldus Pierson, the House’s first headworker, gave talks to children about various cultural expressions represented by this early collection of art and artifacts from a broad range of cultures throughout the world. Generous donors soon began giving Mrs. Pierson interesting objects they had acquired in their travels around the world. By 1927, the collection filled seven rooms and encompassed the first floor of the Neighborhood House’s annex. From 1938 through 1956, the museum occupied space in the Maple Avenue School, enabling staff to enhance programs for children and to establish relationships with area schools. The museum was incorporated in 1943, and the outreach education program began in 1950 with a series of in-school presentations for Morris County students, including talks about American Indian culture. This house, which was entered into the National Register of Historic Sites on April 4, 1977, was constructed in the late 18th century, and was home to the Grimes family, a Quaker family active in the New Jersey antislavery movement. Dr. John Grimes (1802-1875), the most noted and vociferous antislavery advocate in the family, was born in this house and lived here until 1828 when he moved to nearby Passaic County to practice medicine. In 1832, he moved back to the homestead in Morris County and subsequently relocated to the neighboring community of Boonton. New Jersey’s citizens were divided over the issue of slavery. aided his father’s Underground Railroad work, transporting runaway slaves from one community to another. His father owned the Powerville Hotel, which served as a UGRR station. Hopkins’ account of his Underground Railroad experiences appeared in the 1910 publication Boonton: Gem of the Mountain, an account that identified individuals and communities that were part of the Underground Railroad’s operation in the Boonton area.